A demonstrator from Virginia Beach shows support for Supreme Court nominee Brett Kavanaugh on the East Front of the Capitol in Washington. Brett Kavanaugh seemed like the dream Supreme Court nominee for Republican voters and activists when he was nominated in mid-July. He had the résumé and experience to be confirmed relatively easily, but also a clear ideological background that suggested he would join the conservatives already on the high court in overturning Roe v. Wade. But as Kavanaugh’s nomination has grown more contentious amid allegations of sexual misconduct, prominent conservatives have not pushed for his confirmation by hyping up his potential to push jurisprudence to the right, such as by limiting abortion. Instead, GOP leaders, including President Trump, have waged what amounts to an aggressive anti-#MeToo campaign in Kavanaugh’s defense, not only rejecting the charge that he behaved improperly but more broadly arguing that men in America are in peril. Perhaps the most remarkable comments of the past 10 days have not come from Kavanaugh or Christine Blasey Ford (who alleged that Kavanaugh sexually assaulted her), but from Trump and Sen. Lindsey Graham of South Carolina. In turning the Kavanaugh debate into a fight over #MeToo and broader cultural dynamics, the Republicans appear to have played smart politics, at least if the goal was to keep the GOP — senators and voters — onboard. On Friday, two of the three wavering Republican senators — Arizona’s Jeff Flake and Maine’s Susan Collins — announced they would vote yes, likely ensuring Kavanaugh’s ascension to the Supreme Court when the Senate formally votes on his nomination (Alaska’s Lisa Murkowski said she will vote no.) 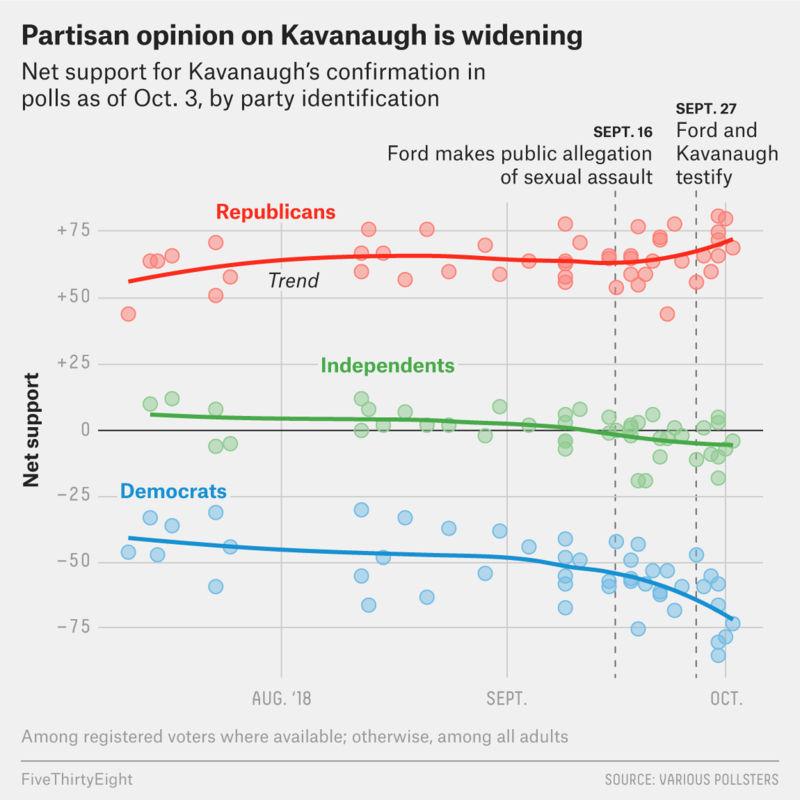 And Republican voters have become more supportive of Kavanaugh since the allegations become public. I don’t think that increased support is because GOP voters are fans of sexual assault, obviously. Instead, there is a deep vein of resistance to #MeToo and what it means in conservative America. A HuffPost/YouGov survey conducted in August found that 54 percent of Republicans had an unfavorable view of the #MeToo movement, compared with 26 percent who had a favorable view. Similarly, 54 percent of Republicans feel #MeToo has gone too far, compared with 8 percent who think the movement has not gone far enough. A Pew Research Center survey in April found that 64 percent of Republicans said it was harder for men to know how to treat women at work amid increased attention on sexual misconduct, a view shared by just 42 percent of Democrats. Those views color and Republicans weigh these issues in an electoral context. A Public Religion Research Institute poll released this week found that a majority of Republican men (61 percent) and a plurality of Republican women (48 percent) said they would consider voting for a political candidate facing multiple accusations of sexual misconduct. Only 19 percent of Democratic men and 14 percent of Democratic women took this view. I’m sure feelings about Trump affected responses to this question, since it basically forces Republican voters to say they wouldn’t vote for a candidate facing multiple sexual misconduct accusations just two years after they backed Trump. That said, I don’t think these responses are only about Trump. The PRRI data found that 80 percent of Democrats think politics would be improved if more women were in office, compared with just 31 percent of Republicans. A variety of studies of the 2016 election have suggested that conservatives who backed Trump did so in part because they were wary of a culture war that they felt they were losing. That election took place before #MeToo took off, but it appears #MeToo is facing a similar resistance on the right to what Black Lives Matter has faced. In fact, it’s worth considering whether #MeToo is not a women’s movement, but really a liberal women’s movement. Pushes for gender equality, by a number of measures, are more popular with Democratic men than Republican women. I think Graham and Trump, even if they have not studied the data, have figured this out. And while those two were perhaps the most vocal in suggesting there is an ongoing war on men, there was little resistance to that idea from other prominent figures in the Republican Party, male or female. Kavanaugh was always a favorite to be confirmed, because Republicans have a majority of votes in the Senate. But once the sexual assault allegations came out, putting an anti-#MeToo message at the center of his defense may have eased his confirmation.